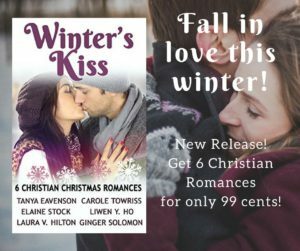 It’s release day for Winter’s Kiss, a collection of 6 Christian romance stories by bestselling authors, including fellow Inspy Romance author Ginger Solomon and myself! This project has been in the works since the early part of this year, so I’m thrilled it’s finally available to readers everywhere. hair, likely from a dog or a cat. Lucy smiled. The smartly dressed man in a blue dress shirt and khakis wasn’t her blood sibling, but he might as well be. Micah had kept his word since they met to do everything an older brother would do: answer questions, give advice, and tease her whenever possible. He had changed in many ways over the past fifteen years—grown half a foot, gained a deeper voice and enough facial hair to require shaving daily—but his heart was the same. Always willing and eager to help people and watch out for them. Being a school counselor was the perfect job for him. He’d helped her navigate through some of the toughest times in her life and now he was doing the same for the students at Union High School. She considered it a privilege to see him in his element. After she experienced what her dad referred to as a reality check (and what she called being broke), she’d given up on her dream of becoming an actress. Instead, she was helping to train up future actors as a drama teacher. It wasn’t as glamorous as Hollywood, but she was able to support herself. And the best part? She worked with Micah every day. “Yes, the parents are separating. I know how painful that can be.” He grabbed his messenger bag and coat and headed for the door. Lucy followed him out of the main office building and into the half-empty parking lot. She hopped into Micah’s sedan as she did every morning and afternoon when they carpooled to and from work. Although they were no longer neighbors—they had both moved out of their parents’ houses—their apartment complexes were within a few blocks of each other. If she had any brain cells left, she would’ve broken off their contact right then. Unfortunately, she still couldn’t think straight. Only when he dropped his hand and began driving did she give herself permission to breathe again. 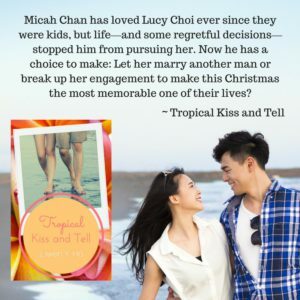 Get your copy of Tropical Kiss and Tell and five other wonderful novellas for only 99 cents! Also, please join me and the other authors of Winter’s Kiss at our release party this Saturday, November 11th. We’ll have special guest hosts, games, and giveaways! Click HERE for the Facebook event page. The party will run from 12-6pm (EST), but giveaways will remain open for 24 hours after the party ends. I look forward to seeing you there! Tell me, how do you feel about stories with flashbacks in them? Please let me know in the comments below! Hi Liwen, I had preordered this and woke up this morning to download it to my kindle- I am looking forward to reading the stories. I don’t mind books with flashbacks, so long as they flow smoothly and add to my understanding of the current situation. Melbourne Cup day today- nice to have an extra day off! Hi Wemble! Aw, thank you so much for preordering the collection! I hope you enjoy it, especially now that you have a day off. :) (I actually needed to Google Melbourne Cup day. Lol. It sounds like fun!) Please let me know what you think of the flashbacks in my story, if they helped you understand the story better or not. Oooh! Thanks for the excerpt! This novell is the next on my list to read. Sounds so good. Hi there! I’m glad you liked the excerpt. :) Thank you for reading! Hi Liwen! Winter’s Kiss was delivered to my Kindle account this morning. Will be reading the selections soon. Flashback writing technique is not my favorite technique. I agree with Wemble that flashbacks need to flow in the plot and add to the resolution of conflicts or the character development. A cold day in SW Michigan. Blessings to all. I enjoy stories with flashbacks. They give us a better understanding of what’s happening or why, without having to write an extensive prologue. Flashbacks worked really well in this story. Happy Book Birthday! Sounds like a fun story! Hi Lori! Thanks for your feedback. I agree that it does take a while to get used to going back and forth. I did include a flashback at the beginning of each chapter, so hopefully that helps with the flow. Thank you for the excerpt, Liwen, and congratulations on the release of the set! Flashbacks are fine if they give deeper understanding of the story. This books was delivered to my Kindle this morning…..I won it on another blog! YAY Can’t wait to read it….fabulous authors! I enjoy flashbacks. They add depth and understanding to the story. I just downloaded the book to my Kindle. Your excerpt drew me in. I want to know how it all unfolds! I’m okay with flashbacks when they are clearly identified as that (which you have done). I’ve read some stories where it was not clear, and I got confused! Now I need to go put my review of this book up on Amazon! I’m not really a big fan of flashbacks, but sometimes they work. Oh yay, so glad you enjoyed the excerpt, Priscila! I don’t mind flashbacks as long as they’re aren’t so many as to pull the reader out of the story…if that makes sense. I just read a book where there were flashbacks and the author did a nice job with them. It added layers to the story without being disruptive. I like friends to more stories! My husband and I were that way before we married :-) We didn’t know each other since childhood like your story, though. I think it makes our marriage stronger because we are still friends and it was the foundation for our romance! Oh, I love hearing about real-life love stories! Thanks for sharing yours, Trixi. I’m glad you enjoyed the excerpt, too!